Have you heard about the Saddle Ridge coin hoard? It’s one of the most famous U.S. coin hoards ever, and it was discovered by a Sierra Nevada, California couple on their rural property in February 2013. The 1,427 gold coins — all half eagles, eagles, and double eagles dated from 1847 and 1894 and buried in 8 coffee cans — have a combined value of some $10 million. 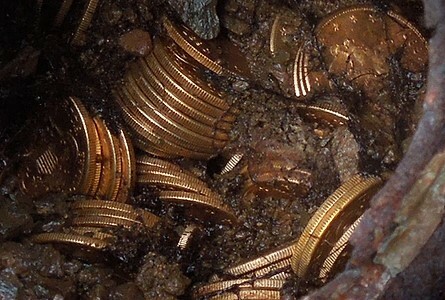 It is the largest-known hoard of gold coins that has ever been found in the U.S! There was $27,980 in face value among the gold coins that couple found – that’s a lot of money for the time that those rare coins were buried, which was probably around the turn of the 20th century. Where Do Coin Hoards Come From? The news about the Saddle Ridge coin hoard has inspired many people to become treasure hunters. Think about it, maybe there’s buried treasure right in your very backyard and you don’t even know it! Of course, the likelihood that you have millions of dollars in gold coins buried in your yard is probably quite small, but definitely not impossible. If your home was previously occupied, especially many decades ago – a time when people more often buried their money than deposited it in a bank – there’s a probable chance you may have some buried treasure of your own, even if it’s only a tiny amount. But how do you find coin hoards like the Saddle Ridge gold coin bonanza? Well, it takes a whole lot of luck. The couple that found the Saddle Ridge gold coins made the famous discovery while walking their dog along a path they had hiked many times before. So how did the coins get there and who buried them? There was a theory that the coins came from a 1901 heist from the San Francisco Mint. That theory was quickly dismissed however, as the coins in the Saddle Ridge hoard have dates varying from the 1840s through 1890s and have mintmarks from all over the country. It’s possible the coins may have come from a bank heist, or perhaps were simply the buried fortunes of a very wealthy landowner. As of now, there is no verified information on who buried the coins or where they had come from just before they were interred in those coffee cans. Did you know that you can buy the Saddle Ridge gold coins on Amazon? So, you want to find a coin hoard yourself? Here are some tips on finding the goods. But, I’ll remind you again – you’re going to need a little luck on your side. #1 – Use a metal detector. Sound obvious? Well, it may seem so to some, but you might be surprised to learn that many people with a glint of gold in their eyes neglect to buy a metal detector before embarking on their treasure-hunting endeavors — usually because of the cost of buying a metal detector. You can rent metal detectors, too. However, if you want to become a treasure hunter or take up hunting for coin hoards as a hobby, your best bet is to simply buy your own metal detector. Check out these tips for buying a metal detector. #2 – Search along public beaches and trails. While you may not turn up much pirate booty, you might find plenty of a lot of other booty on the beach – no, I’m not talking about THAT booty. I’m referring to loose change, abandoned jewelry, and other items. Trails and other public areas also commonly give up small treasures. Of course, if you find anything that appears to be particularly special – such as cremation jewelry, inscribed watches, or personalized pieces – it is best to submit them to local police or lost and found so their rightful owners can hopefully reclaim them. Here’s a list of the top 25 metal detecting locations. #3 – Look on abandoned property. You will need permission to search on private abandoned properties for old coin hoards and other treasures. However, seeking the property owner for permission to search the site (and possibly offer to split the findings with them) may provide you with just the treasure-hunting opportunity you’ve been waiting for. Remember, abandoned properties offer a mystique and sense of adventure you really won’t get anywhere else, but they also have their own perils, too. Abandoned properties are also unmaintained properties, and they could be physically dangerous to enter and search. There may be no insurance policy to cover any accidents or damage to your items or the property. Assume that when you step foot on abandoned property, you do so at your own risk! Here’s how to tell if you’re trespassing on an abandoned property. If you’re looking for coin hoards, you’re definitely not alone! Thousands of people actively engage in treasure hunting each year. There are even online treasure hunting forums for you to join and enjoy, allowing you to learn from others, find out about the latest buzz, and even share photos of your own lucky finds.